The Cartographers’ Guild is a forum created by and for map makers and aficionados, a place where every aspect of cartography can be admired, examined, learned, and discussed. Our membership consists of professional designers and artists, hobbyists, and amateurs-all are welcome to join and participate in the quest for cartographic skill and knowledge. Although we specialize in maps of fictional realms, as commonly used in both novels and games (both tabletop and role-playing), many Guild members are also proficient in historical and contemporary maps. Likewise, we specialize in computer-assisted cartography (such as with GIMP, Adobe apps, Campaign Cartographer, Dundjinni, etc. ), although many members here also have interest in maps drafted by hand. The Cartographers’ Guild is a friendly, open community, welcoming to everyone who pursues cartographic excellence. We love to share our maps, to help one another improve our maps, and to pool our mapping resources. Please enjoy your visit, and feel free to join our ranks! 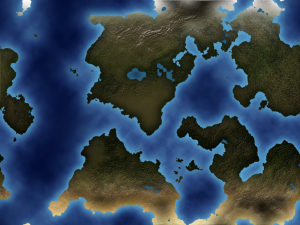 Somehow I screwed the hill layer up and the reef layer doesn’t look fantastic, but given a few more practice runs I think this method of creating beautiful continental maps will become one of my favorite tools in the ol’ gaming toolbox. If you’re interested in learning techniques to make some gorgeous maps, I recommend you visit the Tutorials/How-to section of the Cartographers’ Guild forum. It’s already pretty as it is. Would definitely like to see a more touched up version of it. @Questing GM: Thanks! And I just realized the image wasn’t linking to the large version, so I updated the post. Now you can see a larger, more detailed version by clicking on the map. Questing GM is right, that’s a sharp looking map. Thanks for providing the information about the Cartographer’s Guild. I’m fairly weak at map creation, especially for continents, and it is something I wanted to develop further for some projects at Dungeon’s Master.